Winner of the Military History Matters Book of the Year Award 2019 By August 1918, the outcome of the Great War was not in doubt: the Allies would win. But what was unclear was how this defeat would play out - would the Germans hold on, prolonging the fighting deep into 1919, with the loss of hundreds of thousands more young lives, or could the war be won in 1918? 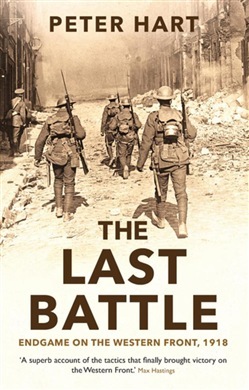 In The Last Battle, Peter Hart, author of Gallipoli and The Great War, and oral historian at the Imperial War Museum, brings to life the dramatic final weeks of the war, as men fought to secure victory, with survival seemingly only days, or hours away. Drawing on the experience of both generals and ordinary soldiers, and dwelling with equal weight on strategy, tactics and individual experience, this is a powerful and detailed account of history's greatest endgame. Acquista The Last Battle in Epub: dopo aver letto l’ebook The Last Battle di Peter Hart ti invitiamo a lasciarci una Recensione qui sotto: sarà utile agli utenti che non abbiano ancora letto questo libro e che vogliano avere delle opinioni altrui. L’opinione su di un libro è molto soggettiva e per questo leggere eventuali recensioni negative non ci dovrà frenare dall’acquisto, anzi dovrà spingerci ad acquistare il libro in fretta per poter dire la nostra ed eventualmente smentire quanto commentato da altri, contribuendo ad arricchire più possibile i commenti e dare sempre più spunti di confronto al pubblico online.